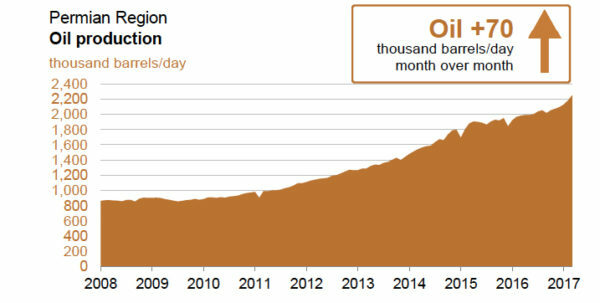 The latest U.S. Energy Information Administration (EIA) drilling productivity report projects U.S. shale oil production will increase by roughly 80,000 barrels per day (bpd) in March, with 70,000 bpd produced in Texas’ Permian Basin, as the following EIA chart illustrates. Representing the largest monthly increase in shale oil production since October, this growth further signifies the resilience and vitality of American shale development. EIA forecasts oil production from the country’s seven major shale regions to reach nearly 4.9 million bpd in March, making up over half of the total U.S. oil production. Thanks to ever improving shale development technologies and techniques, the amount of oil produced from shale as well as the lifespan of hydraulically fractured wells continues to increase. As this report shows, these improvements have resulted in shale development becoming more critical than ever for domestic oil production — especially as producers still face a difficult commodity market. But better development technology is just one factor facilitating the rise U.S. shale oil production, as a wealth of domestic natural resources, particularly in Texas, have also played a key role. As EID recently reported, West Texas’ Permian Basin is awash with oil and EIA’s latest production report further solidifies this fact. According to the report, the projected 70,000 bpd increase will raise total shale oil output from the region to an astonishing 2.25 million bpd. Moreover, this rise in production represents the largest monthly increase in over a year. In addition to unbelievable growth in the Permian, production in South Texas’ Eagle Ford shale is also expected to rise significantly. Projected to increase by 14,000 barrels next month, total output from the Eagle Ford is expected to reach over 1 million bpd. This rise in production means Texas shale oil production will make up about roughly 67 percent of total crude oil production from shale. Overall, the Permian and Eagle Ford shales are the number one and number three most productive U.S. shale plays for crude oil, respectively. While low commodity prices still pose a challenge to U.S. producers, increased growth in Texas shale oil production not only shows the resilience of the industry but also provides a ray of hope for the future of American energy production.